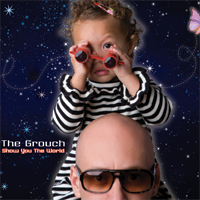 RapReviews.com Feature for April 1, 2008 - The Grouch's "Show You the World"
There is a strange sort of tension in California between Los Angeles and the Bay Area, and living, as I do, somewhere near the center of the state makes you particularly attuned to it. Folks up north tend to feel like LA undeservedly steals their shine, while down south people resent what seems like a snobbish jealousy of SoCal swagger. In an ironic twist, however, this is one geographical beef that is noticeably absent in hip hop, despite its prevalence in more mainstream discourse. Hip hop artists make nice and collaborate well up and down the coast, producing some great music in the process. The Living Legends are one such crew that formed like Voltron around a shared Cali identity, and the group has been creating good music as a whole and through various smaller units and solo projects since the mid 90s. The Grouch is from the Bay Area part of the collective, and he has consistently put in work on a variety of fronts since releasing his first album in 1995. He has put out albums as part of CMA, The Grouch & Eligh, and Zion I & The Grouch, in addition to his work as a solo MC and with the Legends. "Show You the World" is his first solo outing in five years, and on it he sounds as dope as ever, spitting down-to-earth rhymes about his life as a left coast MC. With a voice somewhat reminiscent of Del and a flow that slowly weaves its way in and out and around the beat, The Grouch is a recognizable presence behind the mic, something which has always helped him stand out from the bunch on Legends releases. On his solo work, it is equally endearing, especially when paired with his level-headed personality and unpretentious attitude. As he explains on the self-produced single "Artsy," The Grouch is a true musician even if he doesn't fit some stereotype of an indie artist. You ain't artsier than me – I recycle too, I'm kinda like you"
This is just one of four versions of the hook, which includes other gems like, "You ain't artsier than me cuz you got sideburns and a vintage tee" or "cuz you make weed brownies and knit wool hats." The beat on this one is classic Grouch, with an undulating synth melody line and crisp drums. It fits the track to a T when he describes himself as "more digital than dusty, but trust me I read Torrent Space." The Grouch produces about a third of the tracks himself with good results. He mixes a samba rhythm, horn stabs, and a frantic violin melody on "Clones," using this palette as a backdrop for his disses of the "H2-leasing pimps" posing as rappers on the radio. "Hot Air Balloons" features a jazzy guitar line and busy drum track with a lazy trumpet sample overlaid for good effect. The album closer "Breath" counterposes a syncopated drum beat with a smooth vocal phrase while The Grouch spits the accumulated wisdom of his years with pointers like, "Simple is the new cool." This last track is just begging to be a group effort with his Legends buddies, and therein lies the only real problem with the album. Despite how well The Grouch holds it down on his own, you can't help wishing to hear him collaborate with the LL collective more often. Murs does show up for a decent guest appearance on "The Bay to LA," as the two rap over a schizophrenic yet catchy beat by fellow Legend Eligh. Bicasso and Scarub also show up on "Hot Air Balloons," but for once the guests feel too few and far between. To be fair, Abstract Rude stops by to deliver his smoothness on wax on "God Bless the Elephant," and Raphael Saadiq croons (somewhat strangely) on the title track, but both sing more than spit their cameos. Having heard him work so well with his various collaborative projects over the years, it's somewhat disappointing to find so few guest verses on this one, as the eccentric delivery that normally sets him apart actually grows a bit tired after sixteen tracks. Despite this complaint, "Show You the World" is a solid album from top to bottom. It doesn't beat you over the head with brilliance. Instead, it builds a consistent vibe and slowly grows on you over repeated listens. While I can't place it at the top of the extensive Living Legends catalog, it is another strong piece of work from this dependable crew. Let the California lovefest continue.